He wears the standard necromancer's robe and necromancer's hood and carries a leveled amount of gold. 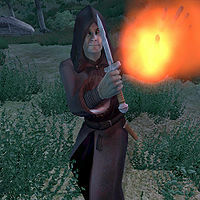 In combat, he is relies on an iron dagger and on a set of leveled necromancer spells. Esta página foi modificada pela última vez à(s) 15h44min de 26 de março de 2013.